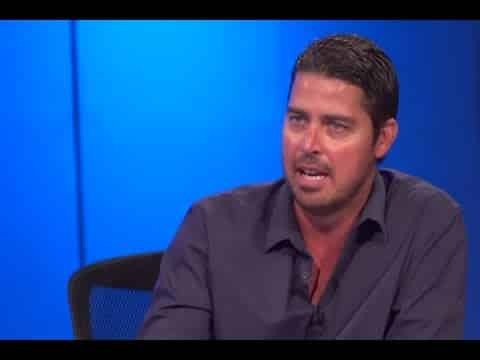 “Journalist” CJ Werleman opines in the Sydney Morning Herald that US President Donald Trump is shamelessly using the Jews. I almost choked on my coffee reading this, given that Werleman seems to be projecting. 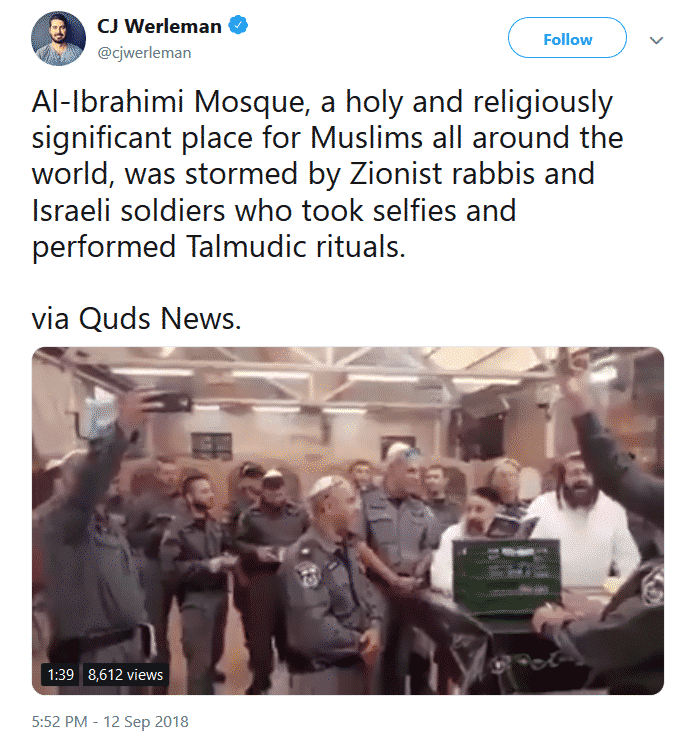 As I have documented on here, Werleman constantly spread lies about the Jewish state, refusing to retract and apologize. He denies being antisemitic, even threatening to sue me for suggesting such a thing, but I think the evidence is pretty clear. 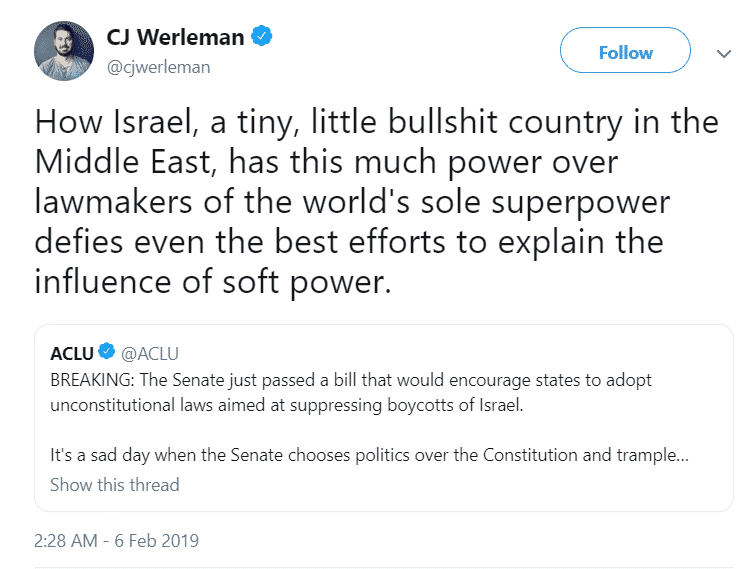 Besides the constant dissemination of easily refutable lies about the Jewish state, Werleman has stated Israel’s actions are worse than those of the Nazis. This again seems to falls foul of the working definition of antisemitism. 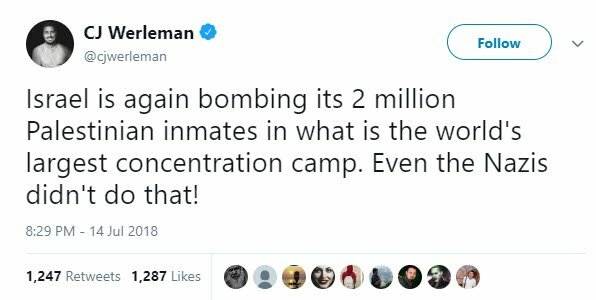 Even though Werleman is careful not to use the “J” word, the implication seems clear. “Making mendacious, dehumanizing, demonizing, or stereotypical allegations about Jews as such or the power of Jews as collective — such as, especially but not exclusively, the myth about a world Jewish conspiracy or of Jews controlling the media, economy, government or other societal institutions. He has also justified terrorism against Jews who live in Judea and Samaria. “Denying the Jewish people their right to self-determination, e.g., by claiming that the existence of a State of Israel is a racist endeavor”? Check! And then there’s this; the Talmud is the the primary source of Jewish religious law (halakha) and Jewish theology. There are way more examples but you get the idea. Despite all the indications CJ Werleman is a Jew hater, he does exactly what he has accused Donald Trump of – using Jews as a stage prop. Werleman claims those who accuse him of antisemitism are doing so solely because he is anti-Israel and pro-Islam. It seems to me his retweeting Jewish people (anti-Israel ones, of course) and tweets against the Holocaust are a way to immunize himself against what I believe are justified accusations of antisemitism. Werleman also complains how Donald Trump’s “rhetoric” has been used by antisemites. Needless to say, Werleman’s libels against the Jewish state are constantly being disseminated by the vilest of Jew haters. And I don’t recall him disavowing them, as he expects Donald Trump to do. So shame on the Sydney Morning Herald for giving a platform to Werleman and shame on Werleman for being who he is.